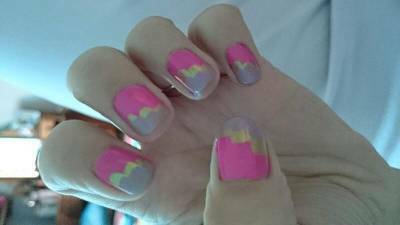 My DIY gel nails at home using Essence and tip tip colors. I recently went out and bought the essence gel nails at home mini LED light and the peel off gel base and uv gel top coat and primer. Now note that I’ve been playing with this so much that my bottles are almost empty and look old haha. But it seems I am getting the hang off it. I paid R99 for each of the gels and R240 for the mini LED light at dischem. 1) start with clean buffed nails, I did short nails this week cause I broke one (eeeeek :( ). I clean my nails with a nail Polish remover and then apply the primer. 2) i then Start with the peel off gel base and it’s best to do this in a room with good lighting so u can see the gel is applied to the whole nail and evenly and pls take care not to go over onto skin or the gel peels off faster and lifts at the sides. Cause I was trying to be cheaper and bought the mini gel lamp i have to do like one finger at a time but lucky it only takes 20 seconds a nail to get it properly set. Once you have base coated all ur nails you can use bit of nail Polish remover to just wipe the sticky layer off, a quick wipe with cotton wool and a dash of nail Polish remover does the trick. 3) this is the fun part! You can literally use any brand of nail Polish to paint a color over the gel base or do ur favourite nail art in your favourite Polish and color. Or even paint a color and sprinkle some glitter on it or stick a nail art sticker. Dischem has some nice glitters and bling for R39. Don’t worry about texture or small glitter bumps cause the top coat will cover it. The fact that the gel base is peel off means you don’t have to struggle with soaking off and can just lift a edge and peel off. It also doesn’t damage the nail. I did and re did and did again and my nails are still fine. Super easy and amazing salon quality! I get up to two weeks out of it if done properly!! On my toes it’s done a whole month! Nails! Re Discovering Revlon and a few tips! Oh wow, looks easy enough, for how long does this stay on your nails ? You get the hang of it quickly then it’s so easy!! I get about two weeks on my hands and my toes are going on over a month now.